A review of Jörg Düwel, Niels Gütschow, Eds., A Blessing in Disguise. War and Town Planning in Europe. 1940 – 1945. (Berlin: DOM Publishers, 2013). War on poverty, war on drugs, war on terror; the politics of change seems to need the metaphor of war. Urban planning is no exception. Already in the nineteenth century a civil organization like the Salvation Army declared war on the slums and the behavior of its inhabitants. When a real war with the expected terror from the air broke out the goal of the opposing parties was ‘to bomb the enemy back into the Stone Age’. In some areas of Europe and Asia the military succeeded, although this had hardly any effect on the will to fight on. Already during the Second World War, politicians and planners alike were talking about a new and better civilization that would be built on the ruins. Today, as more and more secret and confidential information becomes available the view of earlier research is confirmed and strengthened that contrary to the rhetoric of the time and almost independent of architectural images produced there is a great similarity in goals and methods of planners before, during, and amazingly long after the war. 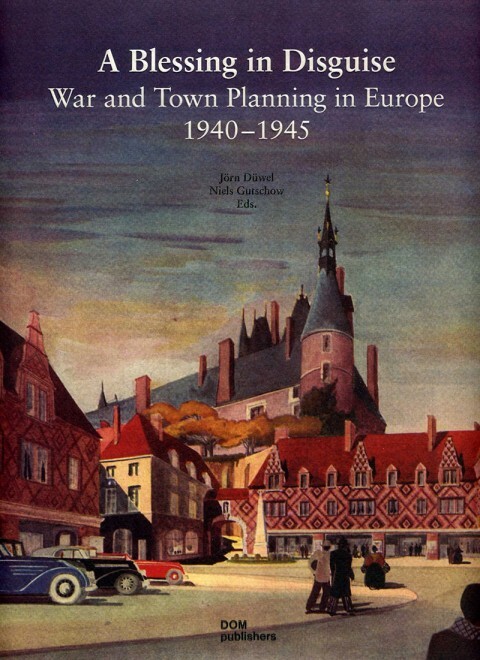 This is illustrated in images as well as in words in a large new publication: War and Town Planning in Europe. 1940 – 1945. In size and weight this publication resembles a coffee table book, but inside is something completely different. The large pages are filled with rather high quality maps, illustrations and texts that send out a grim message. Most leaflets and photographs shown are well known to the expert, but coming from different regimes and countries their combination makes you wonder about the similarities. Are we looking at pictures of so-called democratic or capitalist, communist or Stalinist, national-socialist or fascist societies? With the maps it is even more confusing: are we looking at designs – urban development plans, attack plans – or surveys of construction or destruction? Hard to tell the difference, since the same rhetoric of scale, color and symbols is used in all these cases. Nothing in the book is completely new, especially not if you are familiar with the work of most of the writers. But the combination of their essays and the large-type historic quotations makes one shiver. But the book brings more than discontent. It is also a nice collection of essays of different aspects of city planning before and during the war. By far the most attention is paid to Hamburg. But also some new material is presented about Auschwitz, Lemberg, Köningberg/Kaliningrad, Lübeck, Kassel, Stettin, Wuppertal, and Hanover; for the Netherlands, Rotterdam plays an important role of course but there is also information about Groningen and the Hague; Poland is present with Warsaw. London dominates the coverage about Great Britain and Coventry is present but also Plymouth, Manchester, Exeter, and Kingston upon Hull; France is present with the well-known plan of St-Dié by Le Corbusier and the internationally lesser known but very beautifully illustrated plan for Gien (on the dust-jacket of the book) and some intriguing remarks about Orléans, Le Havre, and Marseille; even more new information is there about the rebuilding plans for Istra, Stalingrad, and Kiev. A whole chapter about planning for Boston shows that war damage was not necessary to wage war on the existing city. 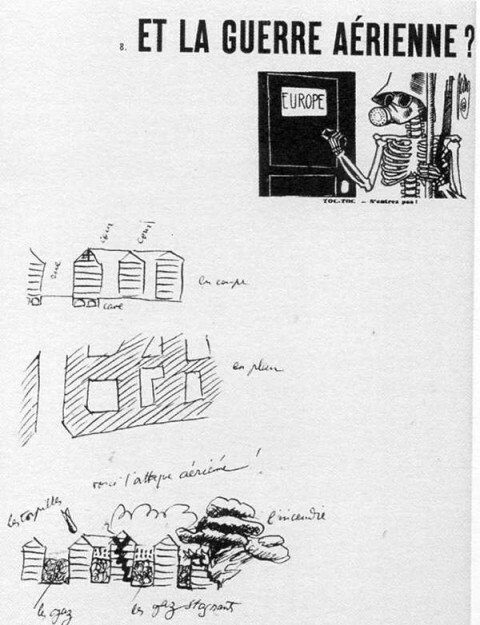 ‘What about Aerial Warfare?’ Le Corbusier, La Ville Radieuse (1935). When resistance against tabula rasa planning was at its peak many people stated contemporary planning proved to be more devastating than the bombing in the Second World War. Less well known is the enthusiasm of planners and most politicians for the opportunities war destruction provided. “What we failed to prove with a thousand good reasons and all the persuasion we could master has now been proved by the bombs, so ruthlessly that the evidence can no longer be ignored.” Well these must be the words of somebody who is connected to national-socialism, right? Indeed they are, but Rudolf Hillebrecht (1910 -1999) left his office in Hamburg after the war to become the Stadtbaurat of Hanover in 1948 using almost the same words to explain his plans. It is not hard to find a similar quotation from a German communist like Ernst May, before and after the war in this book. Has it something to do with Germany and the specific problems of the pace of urbanization, industrialization, efforts and sufferings in two World Wars? Not really; in the case of May tone and words hardly change if he is speaking on international conferences, tries to convince people in Siberia or Africa of his proposals but even more of the urgency to make ‘space’ and clear the landscape of rubble and other things that makes life complicated. And when Martin Wagner in 1944 talks of urban planning as Harvard professor or as he calls himself ‘sworn-in-city-doctor’ he thinks ‘the patient Boston’ is dying unless a much-feared heavy operation is immediately undertaken. So air raids were not necessary to convince people their environment had to change fast and dramatically. The damage by air strikes in a future war were part of the rhetoric of planners, architects, and housing experts before the war but one would not expect the military to have internalized almost the same rhetoric and use it in their strategies of aerial combat. But the staff of respective air forces learned quickly that reinforced concrete burned less easily than wooden houses and that Baroque or Modern open quarters of the city were less easy to hit than denser quarters. So they concentrated on the slums to reach the ‘maximum result’ with the minimum of bombers. 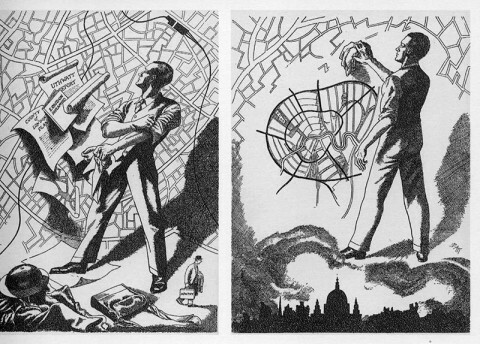 ‘The Planner’, illustration by Oswald Batt (1892-1945) in: Charles P. Purdom, How Shall We Rebuild London? (1945). The irony is that the parts of towns that were constructed in the period 1940-1965 are nowadays evaluated and spoken of in almost the same language as the planners spoke of the ‘slums of the inner city’ to which they formed the alternative. Again, an almost apocalyptic description of life in these parts is used to present and implement huge demolition and building campaigns that are only slowed down by the crisis. * This book was initiated together with the preparation for the exhibition ‘Die erwartete Katastrophe – Luftkrieg und Städtebau in Europe 1940 – 1945’, August – September 2013, at Freie Akademie der Künste in Hamburg.